I love bowls, I’ve made a lot of them, like this one, and this one. I love throwing a bunch of vegetables together, topping it with a flavorful sauce and have dinner on the table without a lot of fuss. They are really adaptable and tend to make great leftovers or lunch fare. 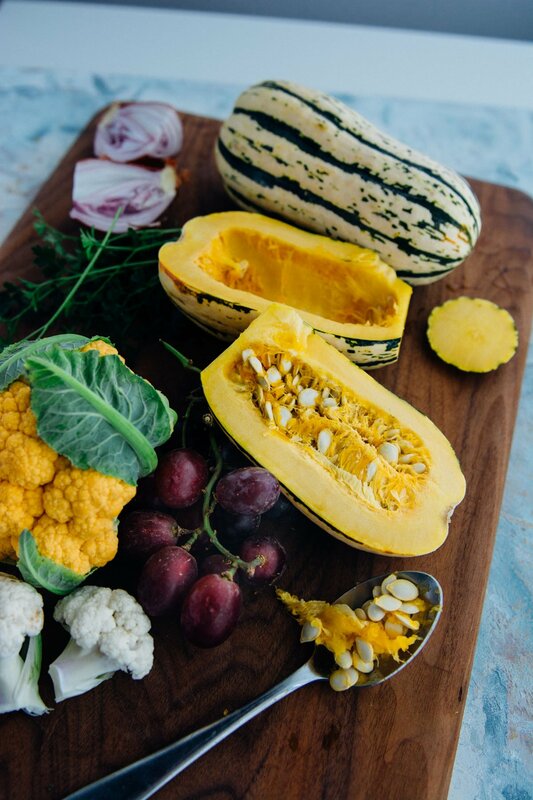 It’s really starting to look like fall here in Portland, so it seems appropriate to start thinking about roasted vegetables and heartier flavors. 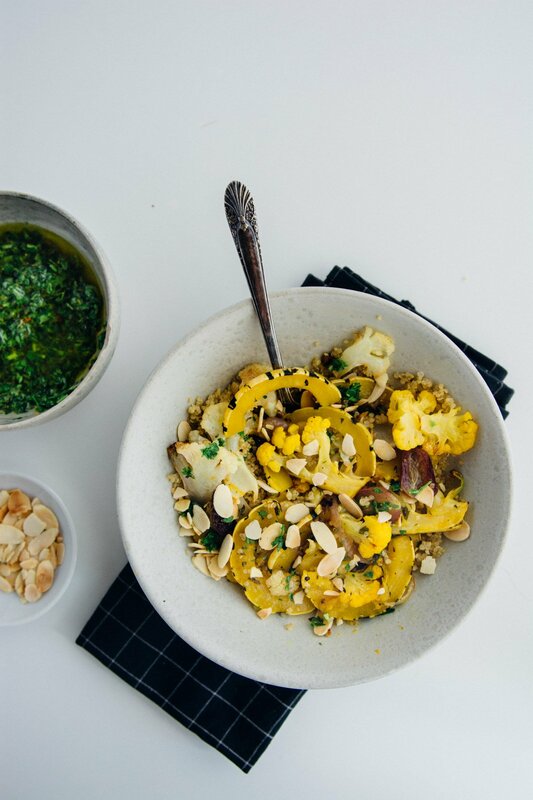 Glow bowls, Buddha bowls, bliss bowls all refer to vegetable and grain dishes that have a good balance of carbohydrates, healthy fats, and antioxidant-rich foods. 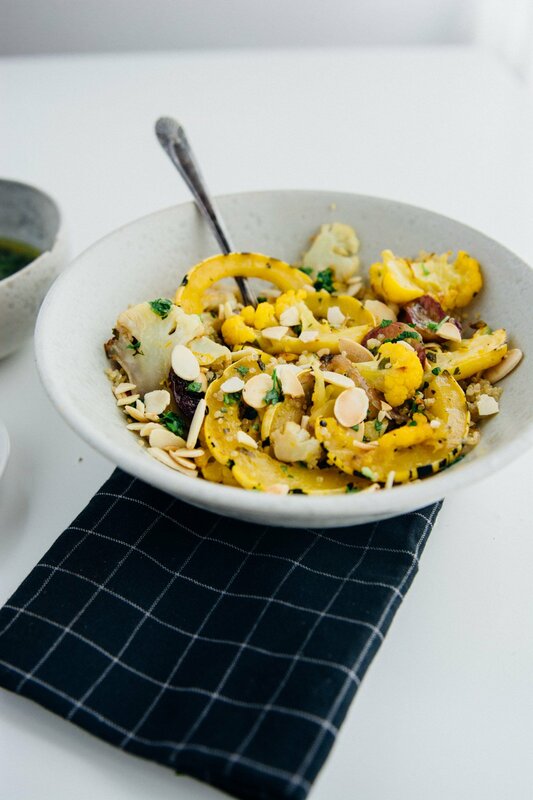 Delicata squash is one of my favorite varieties and the fact that they don’t require peeling and cook quickly make them ideal as a weeknight dinner choice. They are lightly sweet and I decided to play that up with the addition of some orange zest and grapes. If you’ve never roasted grapes you are in for a treat. This recipe can be eaten hot or cold and keeps in the fridge for 3-4 days so it’s a great choice for a packed lunch. 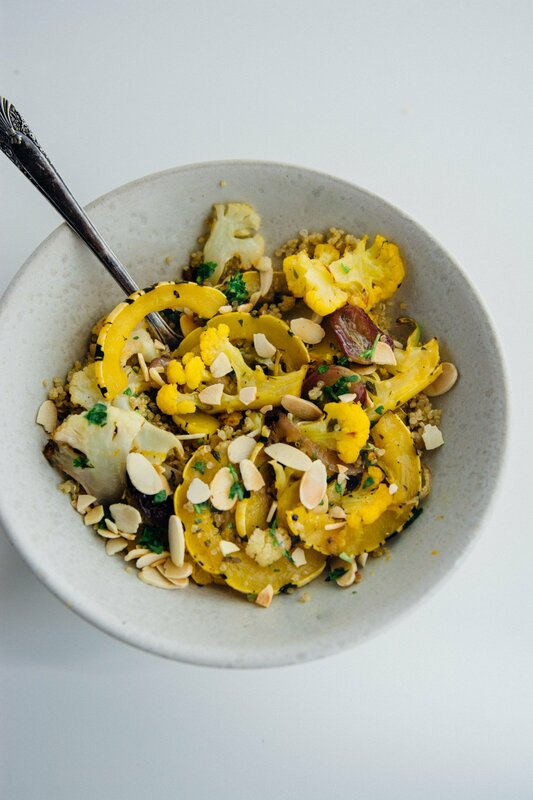 The dressing is a mixture of orange zest, orange juice, parsley, garlic, chili flakes and olive oil, you can also use the dressing for a kale salad or a topping for any roasted vegetable or grilled fish. I served the mixture on top of quinoa, but couscous, farro or brown rice are all good options as a base. 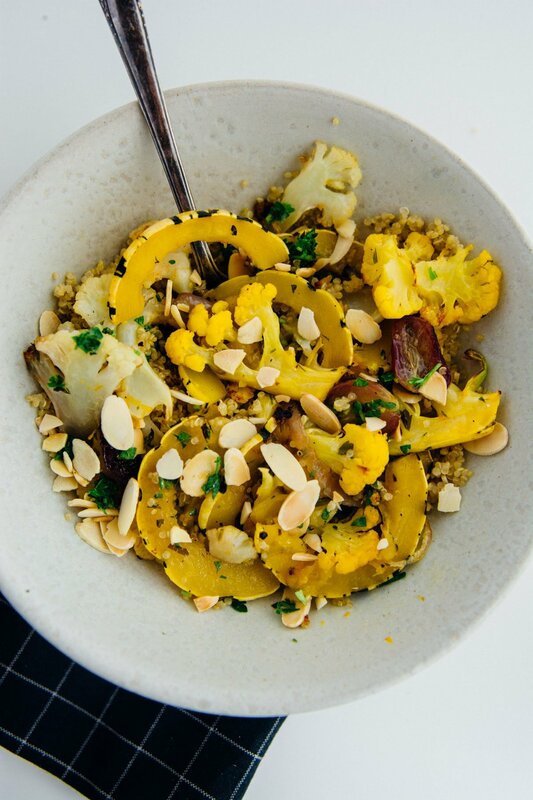 This orange spiced cauliflower and squash bowl is gluten-free and vegan and can be enjoyed hot or cold! Line a baking sheet with parchment paper. 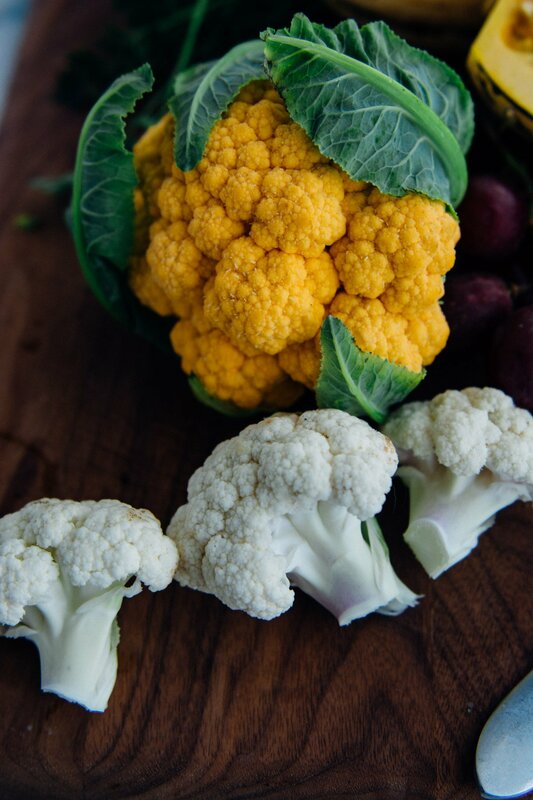 Trim the cauliflower, separate into florets and then slice lengthwise into ¼-inch slices and add to a large bowl. 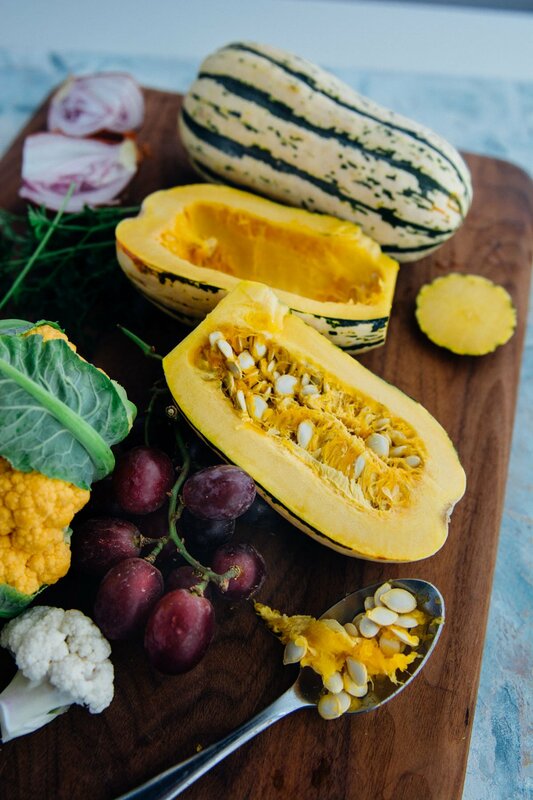 Trim the ends off the squash, cut in half lengthwise and scoop out the seeds with a spoon. 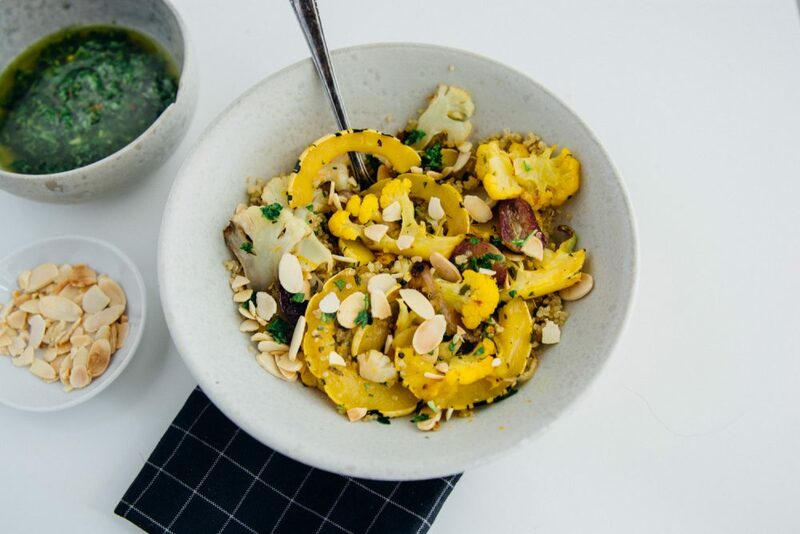 Cut the squash into ¼-inch pieces, and add to the bowl along with the chopped shallots, grapes, parsley, orange zest, and chili flakes and toss with 2 tablespoons of olive oil. Season with salt and pepper and spread the vegetables into a single layer on the prepared baking sheet. Roast the vegetables for 15-20 minutes until they are soft to the touch, and begin to caramelize. 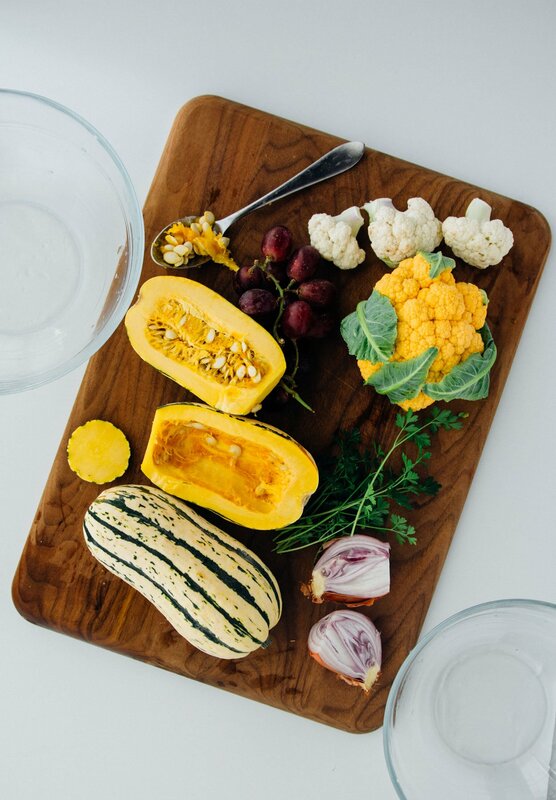 While the vegetables roast, prepare the dressing by combining the orange zest, orange juice, garlic, red pepper flakes, sherry vinegar, salt and pepper in a bowl. Drizzle the olive oil in while whisking and then add the parsley. Taste and add some extra sherry vinegar or salt if desired. 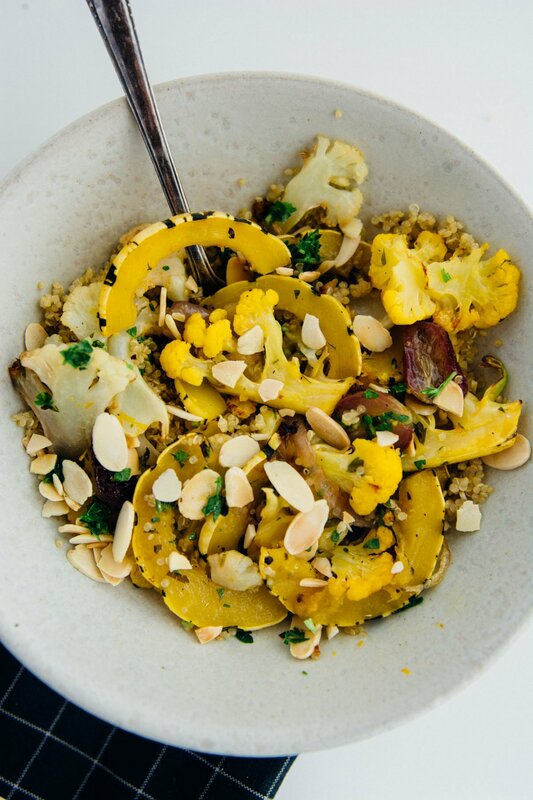 Place ½ cup quinoa into a bowl and top with some of the roasted vegetables and then drizzle with some of the dressing and finish with some almonds and chopped mint. Do you add the grapes at the end? You actually add the grapes to the vegetables and roast them as well. I’ve updated the recipe to reflect the correction, sorry for the confusion. 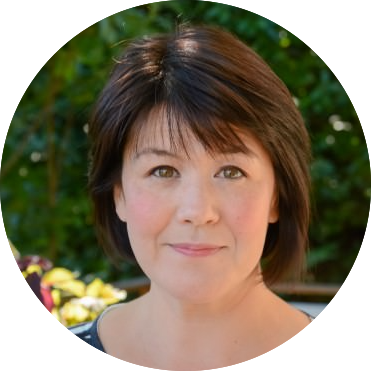 I’d love to hear what you think of the recipe if you try it! Thanks! Are you supposed to roast the grapes with the veggies? I think their addition to the roasting pan is missing from the instructions. Thanks gif a deliciously nutritious recipe! Yes, sorry for the omission. 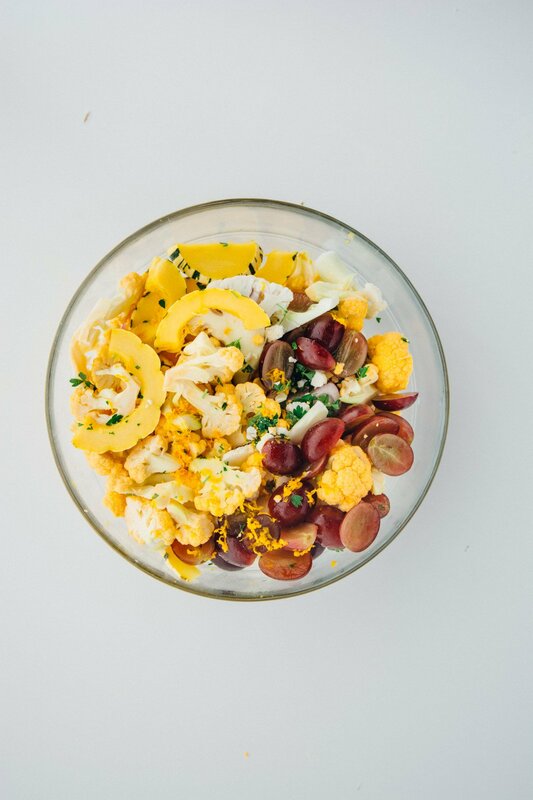 Add the grapes to the bowl along with the shallots, cauliflower, and squash. I’ve updated the recipe so the instructions should be correct now. 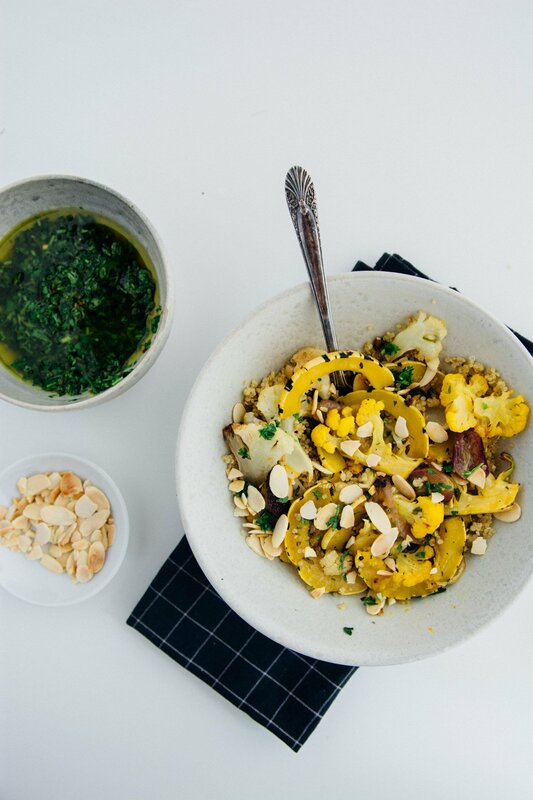 I’d love to hear what you think of the recipe if you give it a try!